Traveling north of Manhattan along the Hudson River lies the Hamlet of Balmville NY, a small slice of the Town of Newburgh. This beautiful location of rolling hills and river views along with varied architecture is home to approximately 3,179 people. Driving around town you will notice a well maintained small community of mostly single family homes, a church or two, a golf course an elementary school, and a very remarkable tree… the Balmville Tree. Growing right around the corner from my home, this tree speaks of historical significance to my community. The legends vary, but George Washington is always included in every variation. Our Balmville Tree dates back to the American Revolutionary War, the days of George Washington and the Continental Army. Stories are still told of him spending time under the tree during his travels. The most popular of the stories is the one where George plants his walking stick in the ground and a tree magically begins to sprout. As fascinating a story as it may be, there is no basis for the conflicting dates, or science to confirm it. In the 1950’s testing on the tree was able to estimate the tree’s beginnings at around 1699. George Washington did live in Newburgh at his nearby Headquarters on the Hudson River, but this was not for another 75 years. By the time he arrived, the tree was way past sprouting. The idea that he visited the location is very possible and most probable as it was less than two miles from his headquarters in the City of Newburgh. It is well known that George spent the final years of the Revolutionary War in Newburgh with his army. While I don’t think George slept under the Balmville Tree, I do believe he did visit the tree and walked on the ground under these very branches we see today. The Hamlet of Balmville was named after the “Balm of Gilead” or “Balm Tree”. A bit of a mistake however, as the tree is actually an Eastern Cottonwood. Maybe if they knew back then, we would have been the Hamlet of Cottonwood? The settlement grew and became ‘Balmville” and then the Hamlet of Balmville. The tree has survived for over 300 years. The normal lifespan for an Eastern Cottonwood, is usually up to 100 years, making it a bit more significant to the local community that it survived for so many years. It is unfortunate that the tree may not live here much longer. The efforts made to use cables and posts has kept her standing tall for the last twenty years, but that era may be coming to an end. The road has been closed recently as the danger of a limb hanging over Balmville Road is real, and with a high traffic location they will need to do something soon. Tourists have been flocking to the area to witness her majesty in the last few days. Car loads of locals from miles around are coming to snap their photo of this tree that has become quite famous indeed. We don’t know what is planned and when, yet and it seems that with her notoriety many people want to visit and be sure to snag a photo or two. The Balmville Tree is on the National Register of Historic Places and has turned this tree in to a tiny “park” in the heart of Balmville. It is the smallest state forest at only 348 sq ft of land, including only one, very old tree. The Hudson Valley is home to amazing landmarks and historical sites right in my own backyard adding in part to the charm. Some historical treasures have more notoriety than others, and most people outside the area are not well versed on the story of our tree. 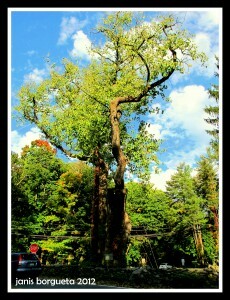 The Balmville Tree is a living piece of history that is at the center of my community, a landmark, an icon. Although preserving the tree with wire and cables has not been easy, it was the community that came together to make it happen. Her days are numbered. One of my favorite things about the Hudson Valley is the love of the historical significance that is palpable by the community. 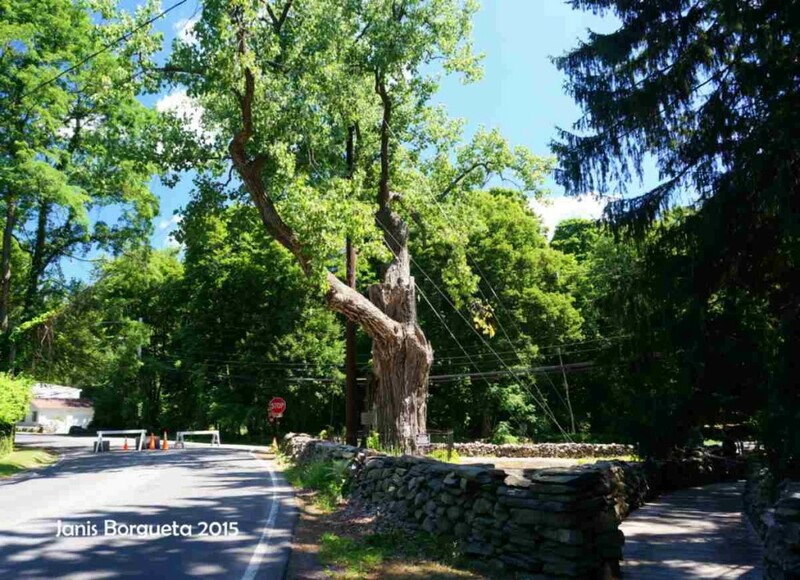 Living in the Hudson Valley has so much to offer, and if you are lucky enough to live in this charming Hamlet of Balmville, then perhaps for you too this special tree is just around the corner.